The Peroia, Illinois-based 11 hospital health system has implemented the Orpheus system at the Saint Francis Medical Center’s 8 Gastroenterology and Pulmonary labs. The hospital has been using the system since 2014 in the Pulmonary Labs and expanded in 2016 to their GI lab. In the GI lab, the Orpheus system connects to Olympus video sources as well as Pentax US devices for upper GI studies. The Orpheus solution provides a hands free user experience by connecting directly to the scope trigger signals to take high quality images. These images are immediately sent to the PACS with a link to the source video. This streamlined workflow enables the high quality images to be accessible in Epic using the PACS zero-footprint viewer. 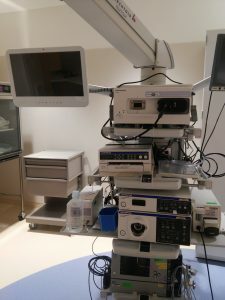 In the Pulmonary lab, the Orpheus system connects four simultaneous video sources: the endoscope, digital microscope, navigation system and a fluoroscope. Prior to installing the Orpheus solution in the Pulmonary lab, it was a print-scan-upload workflow. This manual and time consuming process often resulted in a two day turnaround time and poor image quality in the EMR. Videos of cases performed were being burned to CD’s as for archiving and sharing purposes. Tracking down CD’s for viewing or sharing prior studies has become a cumbersome time consuming process. In the GI lab, documentation was paper based with an automatic printout from the scope’s thermal printer. The images were down-scaled to fit the paper. Then, the nurse would take each paper and staple it on a sheet with the patient demographics and send to Medical Records to be scanned into Epic. The average turnaround was 24 hours with delays of up to 2-3 days. The workflow with the Orpheus platform has proven to be far superior. Full HD quality snapshots o f key areas are being sent to the PACS for archiving, eliminating the need for printouts and scanning. Links to the images in PACS are being created within Epic for easy viewing by clinicians caring for the patient. “The Orpheus system deployed seamlessly and was quickly adopted by the clinical staff. The applications are user friendly and easy to support. The clinical benefits were evident from day one with high quality images now available in PACS and within our EMR (Electronic Medical Record) system”, says Steve Kastelein, Manager of Enterprise Imaging at OSF. Procedure schedules were being hand written in a notebook and on a whiteboard. Now the lab is using the Epic Radiant (RIS) for scheduling studies, creating a study list in the Orpheus system. The Orpheus CAST device provides a user friendly interface to present the worklist and within 2 clicks on its touch panel display, the clinician can start a case. Hands free operation using the Orpheus MTC takes snapshot signals directly from the scope trigger, allowing physicians to focus on patient care, image quality and diagnosis without having to worry about documentation. Every image is automatically sent to PACS and the EMR gets immediate notification and links. “Video is used regularly for patient engagement, consultation, and training and performance improvement. Within a few hours all six rooms were connected, tested and ready for ‘go live’ the following morning–real plug-and-play. By lunchtime the following day, clinicians were using modality worklist, recording video and taking snapshots and using Orpheus Web to access video and images anywhere in the hospital”, says Adam McKeever, working in Steve’s team and supporting the clinicians and the solution. Documentation adherence has increased sharply and in fact more images are being taken since there are no printer limitations. The full video of the procedure is being stored within the Orpheus platform for post procedure review.